Please note that the boxes on the right hand side of our website only display listings for New Arrivals and Preorders. This is not our full stock list; far from it, in fact! Preorder items only appear in this section until they arrive in stock. New Arrivals only stay in this section for the first 2 weeks, then they disappear. 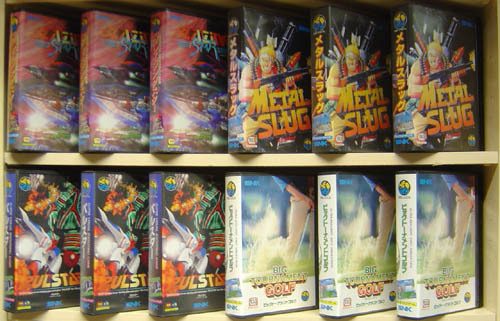 To view the full range of stock, you need to use the drop-down menus at the top of the page: Format (choose your console), Category (choose the type of game or in the hardware section choose whether you want to list the console hardware, accessories or controller devices) and Region (Japanese, USA, UK etc.). Example 1: If you want to see which Japanese shooters we have in stock for the Saturn, select 'Saturn' in the format menu, 'Traditional Shooter' in the category menu, and 'Jap' in the region menu. The forthcoming list can be viewed either as a full product list or a quick list by ticking the 'list' box. Finally, click the '>>' button at the end to see the list. Example 2: If you want to see which PSP consoles we have in stock, then click on the 'hardware' link at the top left side of the page. This will take you to the hardware section of the site (the main website is separated into software/main page, hardware, and merchandise sections). Then, using the drop-down menus at the top of the page, select 'PSP' in the format menu, 'Console' in the category menu and then 'ALL' in the region menu. Again, you can view the quick list by clicking the 'list' box if you want to. Finally, click the '>>' button at the end to see the list. You will see all of our PSP console packages from both USA and Japanese regions. If it's listed on the website, then it means we should have it in stock! Technically, we have everything listed on the website unless a) it's listed as USUALLY SHIPS WITHIN 24 HOURS, in which case, we get another company who we work closely with to send off the goods or b) it's listed as a preorder. Everything else is in stock. Of course, there are always a few small discrepancies with the stock control just list every company but this is a very small percentage of our total stock.